The mountain range of Tambrauw is a great destination for wildlife watching tour. It is located in the Vogelkop region of West Papua. I have organized tours to the region for tourists who want to see tropical birds, butterflies, rainforest flowers, deers, bats, frogs, and fish that live in the rainforest of Tambrauw. 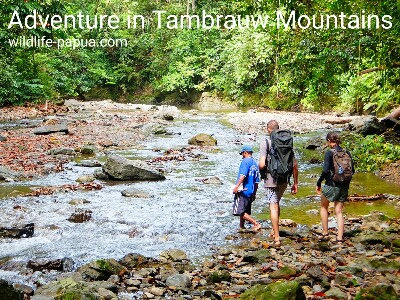 Two weeks ago, I organized a one-week trip to Tambrauw mountains for two American tourists - Naftali and Sarah. We started our trip from Manokwari city by a 4WD car. Before leaving the city, we bought food supplies in yhe suprrmarket and traditional market such as rice, eggs, canned fish, fruits, and vegetables as well as coffee, tea, palm sugar, and biscuits. We would need them during the tour. We also loaded mattrasses, and portable dome tents into the pick-up car. When everything was ready, we left for Tambrauw. Our first destination was District Miyah. There, we watched tropical birds such as Sulphur-crested Cockatoo, Brahminy Kite, Helmetted Friarbird, Brown Cuckoo Dove, Rainbow Lorikeet, and Pinon Imperial Pigeon. We spent 1 night in that district and then the next afternoon we continued our adventure trip to Mount Sakofsiah. Most of the mountains are covered by pristine tropical rainforest. Along the way to the mountains, we saw Blyth's hornbill, Black-capped Lory, and a lot of other birds. The road to Mount Sakofsiah was an unpaved one. There were wooden bridges that were badly damaged. Our cars could not pass on them. So, we had to cross the river. This was part of the adventure. There was also one wooden bridge that was not safe enough for cars. We had to make simple repair to cross it. We arrived at the foot of Mountain Range of Sakofsiah around 14.00 local time. The next road in front of us was very steep and dangerous. Our driver as an experienced driver. He skillfully drove his car to climb the steep slopes to reach the top of the mountains. The landscape view on top of Mountain Ridge of Sakofsiah was very beautiful. I decided to wait on top of the mountains. Below us was Ases village. I asked the driver and my friend to continue their trip to the village whereas I and our American guests would wait on top of Mount Sakofsiah. We wanted to see if there were birds from the cloud forest that we could see before during sunset time. Unfortunately, we could only see Grey-streaked Flycatcher. 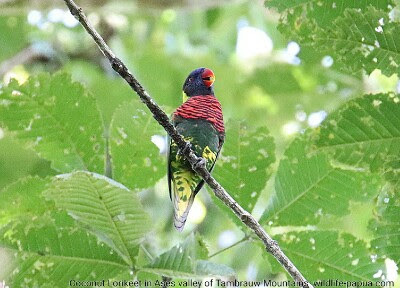 As we walked down the slope to Ases valley, we saw more birds such as Sulphur-crested Cockatoo, Black-capped Lory and Yellow-faced Myna. Ases village was so quiet. There were only a few people living in it. My team had set up the dome tents, mattrasses and cooked dinner when we arrived. Our next adventure in Ases valley consisted of riverwark, swimming, nightwalk and birdwatching. We saw birds, cuscus possum, lizards, lizards, butterflies, rainforest flowers, deers, and frogs. We spent 5 days/ 4 nights exploring the mountain ridge and valleys. The forest was in very good condition. The trails were not clear. Visitors must not walk alone in the huge forest. A local guide must accompany them. In the last day when we were left the Mount Sakofsiah, we saw big deers and cassowary. It was a nice and unique adventure. I like it very much. If you are interested in Traveling to Mount Sakofsiah and want me to organize your tour, please, contact me (Charles Roring) by email to: peace4wp@gmail.com or by whatsapp to: +6281332245180.